Ten former McDonald's workers have sued it in the Virginia federal court for racial and sexual discrimination. The suit alleges that some employees were fired from one franchise because there were "too many black people". It is being backed by a group campaigning for better wages for fast-food workers and the local Virginia National Association for the Advancement of Colored People. McDonald's has not yet commented specifically on the suit. McDonalds issued a general statement, saying: "McDonald's has a long-standing history of embracing the diversity of employees, independent franchisees, customers and suppliers, and discrimination is completely inconsistent with our values. "McDonald's and our independent owner-operators share a commitment to the well-being and fair treatment of all people who work in McDonald's restaurants." The suit is part of a continuing effort on the part of labour organisers to hold McDonald's responsible for the behaviour of its franchisees. McDonald's and other restaurant groups have argued that it should not be held responsible for the behaviour and labour practices of franchisees. However, their position has been weakened by the US National Labor Relations Board (NLRB). It ruled that McDonalds "could be held jointly liable for labour and wage violations by its franchise operators" in July. Since then, current and former employees have filed lawsuits against many McDonald's franchises and the larger corporation alleging wage theft and other illegal practices. In the lawsuit filed in Virginia on Thursday, which is not part of the NLRB's larger activity, 10 former employees - nine of whom are African-American and one of whom is Hispanic - allege that they were subject to "rampant racial and sexual harassment" by supervisors at three restaurants run by McDonald's franchisee Michael Simon. Mr Simon became franchise operator of the three restaurants in late 2013, when the majority of the employees at the restaurants were African-American. Soon after, the suit alleges Mr Simon instituted a plan to hire more white employees, with supervisors allegedly telling employees that the restaurants were "too dark" and they needed to hire new employees to "get the ghetto out of the store". Subsequently, in mid-2014, a large number of white employees were hired and several of the African-American employees who are part of the suit were fired. The fired workers alleged that when they attempted to contact McDonald's corporate office, there was no response. 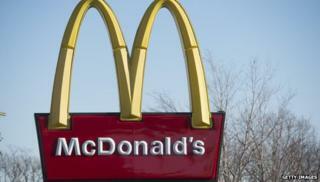 McDonald's is due to report its fourth-quarter earnings before US markets open on Friday.